Animals are constantly bombarded with rich and dynamic sensory inputs, and usually have a vast range of movement options available at any given time. In this scenario, to achieve purposeful, coordinated behaviour, the brain must orchestrate precise interactions across sensory and motor centres, using its knowledge of what the current goal is, which is itself modified by changing environmental contexts. These processes are believed to result in cognitive control, including functions such as working memory, decision making and attentional switching. The smell of smoke can elicit a very different responses if one is at home, or if one is near a barbecue. The same smell can lead to frantic search for the source of fire in the first case, but will be likely ignored in the second case. How the brain selects different actions in response to the same stimulus remains a mystery. Our lab studies these flexible behaviours in mice, using behavioural paradigms where mice react differently to the same stimuli depending on the context. 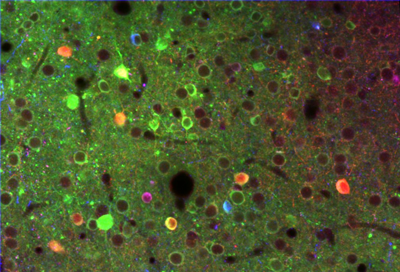 To understand the neural circuit mechanisms of flexible behaviour in mice we apply highly innovative tools and methodologies, including chronic in-vivo two photon calcium imaging, post-hoc identification of multiple inhibitory cell classes, targeted optogenetic manipulations, viral vector based circuit mapping, and quantitative mouse behavioural assays. With these methods we aim to identify how context is represented in the brain, and how this representation modifies or biases the processing of a distributed network of both sensory and motor brain regions. The prefrontal cortex is crucial for cognitive control, and is believed to represent rules or contexts as population activity patterns or network states. Subsets of these neural populations may project to different sensory or motor areas to influence processing in their target areas in a context-specific manner. A key projection target of cortical neurons in general and prefrontal neurons in particular is the striatum in the basal ganglia. The striatum is known to be essential for flexible behaviour, and there is compelling evidence for its central role in cortical control of behaviour. We are testing hypotheses regarding the interactions between sensory cortex, prefrontal cortex and the striatum, in head-fixed mice performing context-dependant flexible behaviours. We have previously observed strong modulations of neural responses in sensory cortex during such behaviour. By measuring and manipulating the activity of specific excitatory and inhibitory neural populations in these brain regions during the behaviour, we aim to formulate a detailed model of behavioural flexibility.